I am absolutely loving all of the gorgeous printed, bright and colourful trousers and shorts around at the moment, they definitely liven up any outfit. What i love about them is that they are so easy to style as you really don’t need to overpower your top half as your bottoms definitely do all the talking! So, here i have picked out the best of the bunch,enjoy! 1. Topshop have some amazing printed trousers online at the moment, i am still besotted with the floral joni jeans but they have still not come online in my size wahh! Anyway, these tropical print ones are amazing, so fruity and summery, how could you not love these?! I think i might get a few stares wearing these in Plymouth though haha. 2. These are the least garish pair from my wishlist but are just as equally beautiful. The tropical theme lives on and i love the pale pastel wash of these shorts, bright/neon tops would look amazing with these too. New Look really do have a great spring/summer collection this year. 3. I am still very much a fan of tie dye and these Boohoo ones are gorgeous! I cant help but think i would be able to do this myself though to an old pair of shorts,it can’t be that hard?! They would be totally unique too. These would be perfect for any upcoming festivals! 4. Aren’t these trousers just perfect! The skinny fit of them is really flattering and the yellow florals are slightly different to the pinks that have been circulating the shops recently. Zara always get it right with their tailored trousers. 5. After seeing Kavita wearing these shorts at Coachella these firmly fell onto my wishlist. Again these would be ideal for festivals as she demonstrated by wearing them. American Apparel are slightly more expensive than other shops and i have seen similar pairs to this on Ebay a lot cheaper so its worth taking a look. 6. Last up is this intricate pair of shorts from River Island. The Indian detailing is beautiful and so feminine, i love the floaty look to these and they would be perfect with cami tops in the summer. What do you think of my picks? 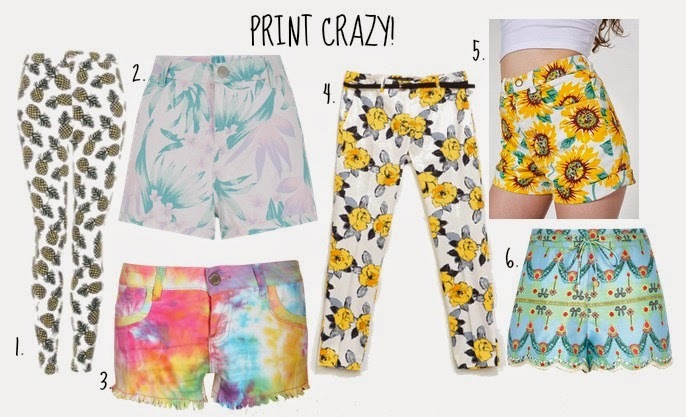 Do you like printed bottoms? Which are your favourites?